Good Morning and Happy 2017! One major goal my hubby and I have this new year is to get this kitchen completely finished and we are so close! Over the holidays, Russ got the backsplash installed. 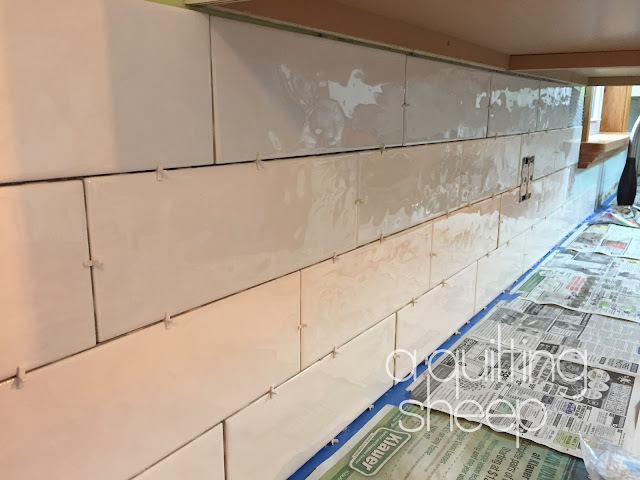 All that needs to be done is the grout. We are going to use a light grey colored grout. Here is the big picture of how the kitchen looks. So close to being done! I quilted it with my go to wavy lines. I like the texture it gives and its easy. =) I get to give it to her today! Until next time, have a happy weekend!! The kitchen looks great! 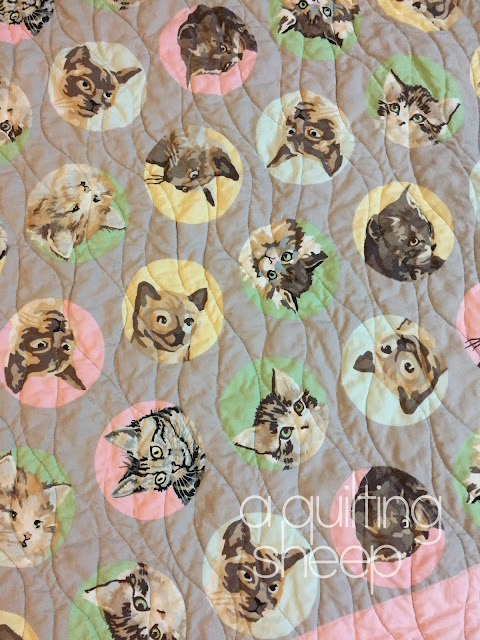 The kitty quilt is precious. Happy New Year! What a beautiful kitchen! Cute baby quilt with the 'Meow' fabric! 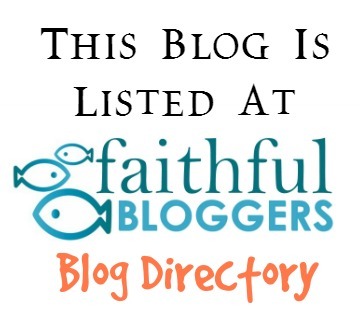 With that pretty kitchen, I'm betting someone will be expecting you to do some fancy cooking! 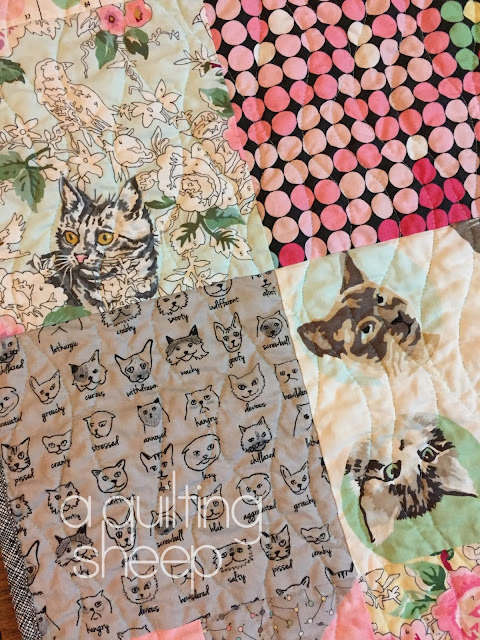 The kitty quilt is really cute, and I like your quilting! ---"Love"
Love your kitchen it is so pretty. I am jealous! 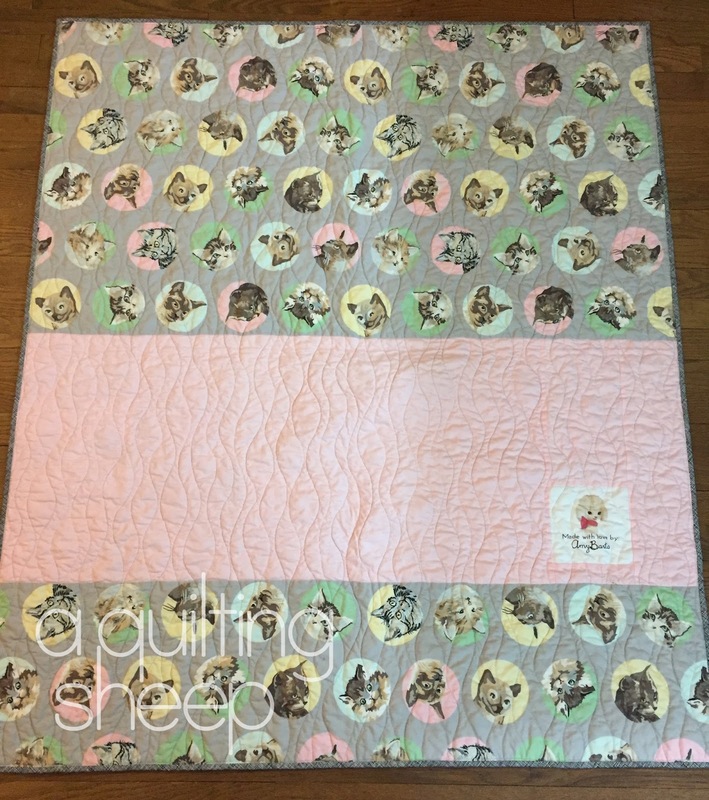 Cute quilt for Miss Millie! Enjoy the baby time. WOWOWOW Amy, your kitchen is so classy and snazzy. I love the quilt with the kitties. I love kitties, well, my kittie Pierro. He was only 8.5 and died in November. It was terrible and I did a lot of sobbing. The fabrics in this quilt are just adorable. Perfect quilt!! Your kitchen looks wonderful, you will enjoy such a cheerful space. I love the fabrics in your quilt and the quilt itself of course. I just finished packing away Christmas decorations and hope to get to a little stitching later. Happy new year. 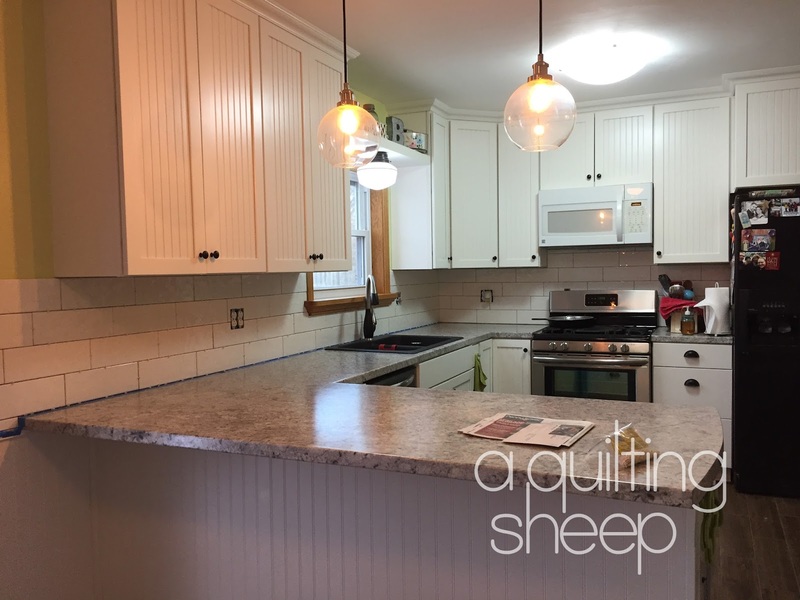 Your kitchen is looking amazing and I love your baby quilt! Glad to see that the marathon kitchen update is almost done! Love Millie's quilt! So glad that you get to present it in person! 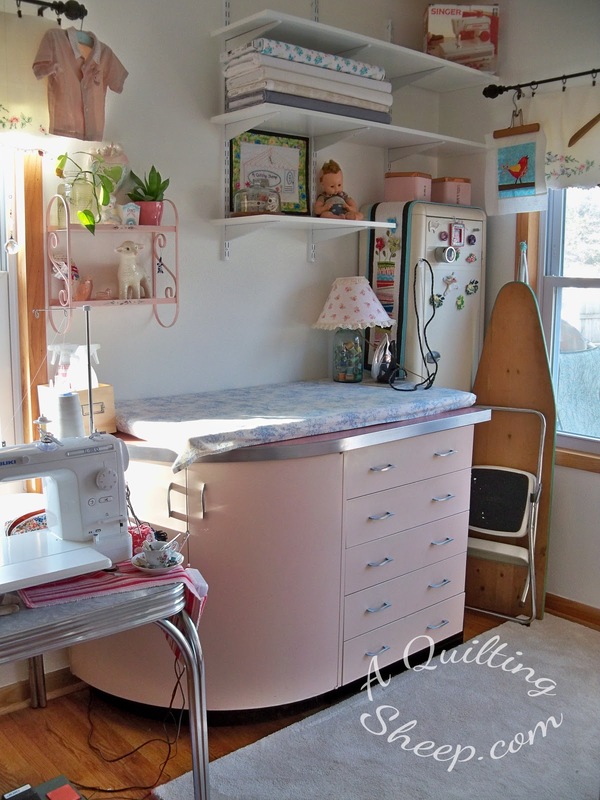 Your quilt is adorable and thanks for letting us know that you used Moda fabric. I have a granddaughter that loves cats, so that might be a great choice for her. As for your kitchen . . . I love white kitchens and yours is beautiful! Ours is a vintage kitchen with cupboards built in the 1930's or 40's . 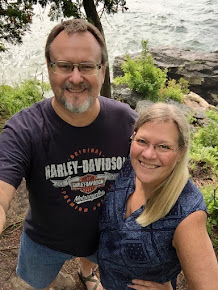 . . whenever they decided to put running water into this old house. I have the top cupboards all painted white and the under counter cupboards painted turquoise, but I'm thinking seriously of painting it all white. Love the subway tile . . . and the big window over the sink. Amy your kitchen is so pretty. I really love all the work that y'all have done. Can only imagine how much you are enjoying it. Your quilt for Millie is adorable. Hope you are getting to enjoy that sweet baby girl. ah,your kitchen is so refreshing,love the brightness.....calming too! such an adorable quilt and I'm not even a super cat person~precious for Millie and so sweet to include your son-in-law,I try to do that too. I'd have to make a Star wars or Marvel Comic quilt though :) Enjoy cooking in your new kitchen!! Ooh the kitchen looks amazing!!! I adore subway tiles - so clean and fresh looking. Love it. Pretty quilt Amy, but then I'm partial to kitties myself, lol....oh, a very happy belated birthday to you!!! !